I’m about to cycle Zurich’s Stauffacherbrücke. It’s an early fresh morning. Spring has melted away the layers of ice of a crystal clear Sihl river. Like every morning at the crossing, while waiting on my bike the traffic lamps to switch green, I spot the construction site of Zurich’s former main stock exchange building. The scaffolding in front of the impressive portal-like entrance hides behind a head-high temporary structure. Painted in blue and white letters it reads, “Education First – The World Leaders in International Education”. One of the world’s largest education companies will have taken over the famous landmark building by the end of 2018, completely restructuring its inner core. The “Tagesanzeiger”, with its publisher’s view right across the Sihl, titled the ‘take over’, “Zurich’s stock exchange becomes a school”. The transformation of the finance world literally arrives in the education and learning sector. The computerization of finance ended not only in its collapse in 2008, but an ever more aggressive und unequal flow of capital into all parts of industries and our lives. The digitization of education and learning landscape could mark a turning point for the new technologies to do better for a learning society. 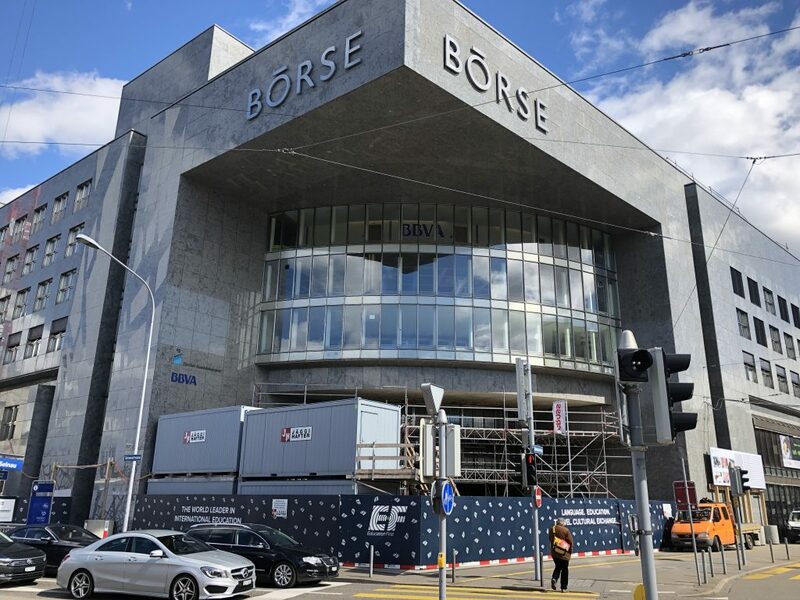 In our team at Kickstart Accelerator, we work on both – the tech in finance and education right across the street from the ‘Neue Börse’ at Kraftwerk Innovation Space. This week, we launched into our third program year with a variety of partners, ready to pose their challenges in the search of national and international startups. The new ownership structure of Kickstart – since 2018 as an Impact Hub Initiative partnering with digitalswitzerland – allows us to refine our approach. We opt into such new fields that we care about like the technologies of education and learning – and keep what has been proven key industries for the Swiss innovation space, like finance, smart cities and food tech. We shift towards even more piloting between startups and established companies and institutions, such as multinationals, SMEs, cities, universities, and the government. This requires Kickstart’s focus to change from startups to scale-ups – more mature startups that are capable of partnering with the established players. Kickstart’s EdTech focus, in addition to the Impact Hub’s collaboration and multi-stakeholder approach, merges the tech and impact focus in an exemplary way forward. Our impact focus signals Government Councillor Dr. Silvia Steiner’s patronage of the EdTech Vertical launch in Zurich. If we consider impact in the education industries serious, it requires close partnering with the government. Similar to what happens at SBB’s Europaallee – large tech companies overtaking government ground – there will be new players venturing and pushing the boundaries of a resilient, often times stiff education sector. Yet, as the high demand of forums and spaces like Kosmos and Die Republik shows, there is a solid demand among Zurich’s citizens to become more engaged in debates around the direction of the technological society – a rather old idea that finally seems to arrive in practice. Impact driven tech in education and learning means better and simpler tech. Kickstart’s integration of science and engineering driven technologies (Deep Tech Nation Switzerland) across the four verticals is an important step we do into this direction in 2018. Yet, simpler tech does not mean less techie, but more driven by the contextual complexity and human-centered processes of learning as a social practice (and technological, think of your old school’s blackboard). Constructivist learning sciences experts like Dr. Dominik Petko, Vice president of the University of Teacher Education Schwyz, speak of Zones of Proximal Development (ZPD). In today’s light of digitizing and technologically equipping the learner’s pathway, the ZPD theory considers an individual learner’s limits within these developments. Dr. Petko’s publicly funded work as an academic, like Learningview.org – an AI optimized learning schedule that identifies a student’s overload within flexible learning environments – could inspire (more) solid pedagogic concepts for EdTech business models in what industry experts sometimes describe as frustrating product driven business landscape. In this vein, we will build on EPFL Lausanne’s experience in EdTech, particularly its 2017 launched EdTech Collider, as well as new strong partners such as ETH Zürich and the University of Zürich. If we look at the leading EdTech innovation clusters around the world in China, Scandinavia, the UK and the US, Switzerland needs to use today’s momentum in order to make its mark in what Switzerland should be strong in as a knowledge and technology-based society. Mercator Foundation Switzerland’s three-year support of the EdTech vertical acknowledges our vision to help build momentum for an EdTech cluster in Switzerland. More momentum will join if the Federal Department of Economic Affairs, Education and Research and the Federal Council will approve the EdTech proposal of its National Research Program on digital transformation. digitalswitzerland raised initial industry momentum for EdTech in Switzerland. We are now expecting Swiss firms to see education and learning not only as a politically poisoned, low-revenue business, but EdTech as a field of innovation for new technologies, new markets and society at large. I personally look forward to having Education First setting up its 1000 employees in 2018 right in front of our office space. I hope that EF will be opening up its ‘portal’ and not be as much of a black box like the emerging tech and information industry has become. Akin to the Spotify and iTunes models in an analogy to the music industry, the education sector rightly fears a Napster moment. Yet, industry players will need to be prepared for carefully riding the long rising tide of the education and learning sector, especially in a social democratic Europe. What do we take from this momentum on a personal level? Many of us were rebels at school. I personally was one ‘without a cause’. Only at the higher-ed level, I had the privilege to attend a reform pedagogic university. I still consider this time as a crucial starting point in becoming a confident learner, and hence responsible citizen. At Impact Hub, we boldly say, “The world is changing, and we are on the transition team”. Yet, what kind of competences are required in this transition team? And, are we, even as explorers, not also damned to continue our learning and education? I know and respect the competences of our community of founders and starters. However, I truly believe that it’s not (only) through the startup experience that we capture all aspects of life(-long learning). A proactive approach for founders to take learning more seriously and to combine it with startup success could be to become educators and instructors ourselves. There is an armada of young people and talents (backed by a political agenda) waiting to learn from the startups’ way of hustling ourselves into a structurally different future of work.